The Original Factory Shop, the value department store business that agreed a CVA with creditors last autumn, has bolstered its management team with two senior C-Suite hires. A greater number of people believe now is the right time to splash out on big-ticket items such as furniture according to the latest Consumer Confidence Index figures from GfK. Burnley bed manufacturer and furniture distributor Sweet Dreams aims to build its business in the Republic of Ireland after engaging Declan McCarville as sales agent. Furniture and general merchandise conglomerate Steinhoff International Holdings says the release of audited accounts for 2017 and 2018 will be delayed further. Historically, Howdens depots have been about 10,000sqft in size. Howdens, the trade kitchens supplier, says there is scope for more than 150 new UK depots after it developed a new smaller format that will take the business into both rural areas and big cities. An associated company has acquired certain assets of Beaumont Beds, the southeast England retail chain that entered administration with the closure of its stores earlier this month. BFM, the trade association for UK furniture makers, says it has an open line into Government to air manufacturers' concerns regarding a potential No-Deal Brexit. Competing tableware makers Portmeirion and Churchill China have each upped their equity positions in a key local supplier to both businesses, giving them full control between them. Actona's Danish headquarters and (inset) one of its sofa ranges. It has upholstery production facilities in China and Ukraine which between them employ around 1,000 people. Profits halved at the Actona Company after the European furniture supply giant's merger with sister company Interstil gave rise to a number of one-off integration expenses. The chairman of Laura Ashley has rebuked Flacks Group for its "unsolicited and highly opportunistic" indicative offer, saying it is causing unnecessary volatility and is not welcome. Sales fell, but will almost certainly rise next week when its performance will compare with the 'Beast from the East' week. John Lewis & Partners recorded a seventh straight sales decline for home merchandise last week, blaming "discounting and half-term offers at competitors." Big Shots, the biggest fundraiser in The Furniture Makers’ Company’s calendar, will mark 25 years of raising money for the furnishing industry charity in 2019. Steinhoff's UK HQ at Cheltenham, Gloucestershire. The conglomerate that owns UK beds and furniture chains Bensons for Beds and Harveys has promoted experienced retail industry executive Mark Jackson to CEO of Steinhoff UK. The CEO of Tempur Sealy International says its direct business is unlikely to grow far beyond 20 percent of total revenue for strategic reasons, with the bedding giant committed to third-party vendors. Additional tariffs were due to come into effect March 1, 2019. President Donald Trump says the United States will delay the implementation of additional tariffs on Chinese-made goods, including finished furniture, after the two countries made "substantial progress" on trade talks. Flacks Group has confirmed its interest in Laura Ashley but says if it makes an offer it will be for no more than £20 million. Its comments come despite the owners of the business saying they do not wish to sell. DBC International, the distributor behind the M Line and Wave mattress programmes, is keen to return to the UK market after earlier supply arrangements came to end. UK sales believed to be in the hundreds of millions of pounds for Wayfair. UK sales for home furnishings retailer Wayfair are estimated to have shot past £200 million in 2018 as the ecommerce conglomerate's heavy marketing investment delivered top-line payback. Furniture-to-fashion retail chain Laura Ashley will be the subject of a takeover approach by a Miami based investment company with links to the UK, according to The Sunday Telegraph. Retail sales advanced for The Conran Shop. Majority shareholder Sir Terence Conran has provided seven-figure debt funding to the Conran group, parent to furniture and design retailer The Conran Shop, for the second straight year. More retailers than not are forecasting volume growth next month according to a new survey by major business group the Confederation of British Industry (CBI). The retailer closed 16 stores as a result of its CVA. Beds specialist Mattressman says it is now in a strong position to "weather the economic storms ahead" after it downsized via a CVA last year when tough trading and the loss of data combined to force a restructure. A proposed tax designed to level the playing field between store-based and online retailers could disproportionately impact retailers of upholstery, cabinet, carpets and mattresses. 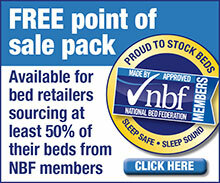 The National Bed Federation's updated Code of Practice — its third iteration since it launched in 2013 — has been accepted as Assured Advice by trading standards, as the previous two versions were before it. Sales of furniture were down double-digit between July 1–December 31, 2018. Furniture-to-fashion chain Laura Ashley attributed a double-digit slump in big-ticket upholstery, cabinet and bed sales for it sinking to a half-year loss in the 26 weeks to December 31, 2018. Upholstery sales were up more than a third, John Lewis said. Upholstery sales were strong in an otherwise bleak week for John Lewis & Partners home category goods, with the department store mutual posting a sixth straight year-on-year fall. Dr Lindsay Browning, author of troublesleeping.co.uk, has been appointed Sleep Ambassador at And So To Bed, the UK and international high-end bedding retailer. Contract and hotel furniture maker YTM Group has ceased trading after being placed into administration. All 117 employees have been made redundant. Interior furnishings group Walker Greenbank is to begin a cost saving exercise as it looks to mitigate the impact of weakening UK brand sales on the business. Beaumont Beds trades from stores across London and southeast England. Independent specialist retail chain Beaumont Beds has been placed into administration with office holders having already culled a number of its stores on appointment and hired agents to find a buyer for the business. Year-on-year UK sofa retail sales advanced in January, marking a first annual rise for the category in the past eighteen months, though the total was still lower on a two-year basis. The diversified manufacturing and services group that lists heritage mattress maker Millbrook Beds among its subsidiaries wrote more business in 2017–18 but higher costs weighed on profits. Pan-European ecommerce furniture retailer Home24 said revenue gains outstripped the markets in which it operates in 2018 with it continuing to move closer to profit. The sun set on the Fabb Sofas business last June. PwC, the big-four consultancy firm overseeing the winding down of the now-defunct upholstery chain Fabb Sofas, says its fees might be higher than first anticipated. Creditors of the heritage rise and recline chair maker AJ Way, which filed for insolvency last autumn, face a potential seven-figure shortfall according to a report by administrators. Scottish based business posts seven-figure deficit in latest accounts. Wood furniture imports into the UK declined 2.2 percent in December confirming a year-long trend for weaker trade with three of the four biggest source markets for British buyers. Retailers and importers built mattress stocks at the close of 2018 with the value of foam and sprung units bought in from abroad up by a quarter year-on-year in December. Double Olympic gold medal winning rowers Helen Glover and Alex Gregory visited Dreams Buckinghamshire HQ to help launch the partnership. Bed specialist Dreams will become the first-ever official sleep partner of the British Olympic team, agreeing a partnership for the run up and duration of the Tokyo 2020 games, which begin in July next year. Upholstery, particularly leather, was cited as impactful on January's inflation rise. Retailers held their nerve last month as furniture retail price inflation climbed to a nine-month high in January, driven by shallower discounts. Any lingering doubts over Sports Direct International's involvement with Sofa.com have been put to bed with details emerging of a credit line agreed between the two parties.